You may have thought that astrology didn’t have much to do with numbers. (Just stars and planets and houses.) Well, I want you to think again. Numbers have a great deal to do with astrology and not in just setting up a chart. These days, the computer does all the calculations to “erect a horoscope.” But, numbers stand behind the horoscope in many ways, are written all over the chart, and tell a whole lot about the native. Many examples will be presented in later lessons. For the time being, we will continue looking at the Big Little Numbers which stand behind all of our lives. We have already looked at the Triune (3) in the Universe - Above and Below - in the Macrocosm and Microcosm. This time we will consider how Seven (7) fits in. Many ancient traditions including the Holy Bible (Book of Revelation) give hints about the importance of Seven. Three stands Above and Below, but so also is Seven Above and Below. Seven Great Rays enliven the Universe, as do the Seven Sacred Planets in our Solar System and the Seven Soul Centers in Man. Seven is a lucky number and shows itself frequently in the Outer world, suggesting its importance in the Inner worlds: 7 days in a week, 7 major tones in the octave (why isn’t it a heptave? ), 7 colors in the spectrum, 7 seas, 7 continents. Seven is key to the energies which move from Above to Below. There are so many hints -for those who seek - which help us recognize the serious synchrony and amazing associations within and around us. Esoteric Astrology gives clear suggestions that we are not just connected to the Spirit of Planet Earth and of the Solar System but also to the Seven Spirits before the Throne. The Lives of the Seven Sacred Planets will some day be shown to enliven the Chakras - Centers of Consciousness in our very being. We are - to any keen thinker - much more than body. More than emotions and mind, to be sure. Our very souls join us to the Universe as we are made in the image and likeness of the Creator. This is one way of looking at the idea of the Rainbow Bridge. Beyond that, we are part of the manifesting body of the Great One. Anciently (prior to the discovery of Uranus in 1781), the horoscope was less crowded and only mapped the positions of 7 luminaries: Sun, Moon, Mercury, Venus, Mars, Jupiter and Saturn at the time of birth. Those symbolized the seven sacred parts of our soul, psyche. Sun and Moon representing hidden or undiscovered planets. • Interestingly, there are seven sacred planets and some 70 hidden or undiscovered ones according to Esoteric Astrology. That fits quite nicely with our seven major centers (chakras) and 70 lesser ones (21 minor and 49 secondary). Some day, astrologers will be able to accurately relate the major planets to the major centers in each human form. That will surely add another valuable layer to the work of astrology. 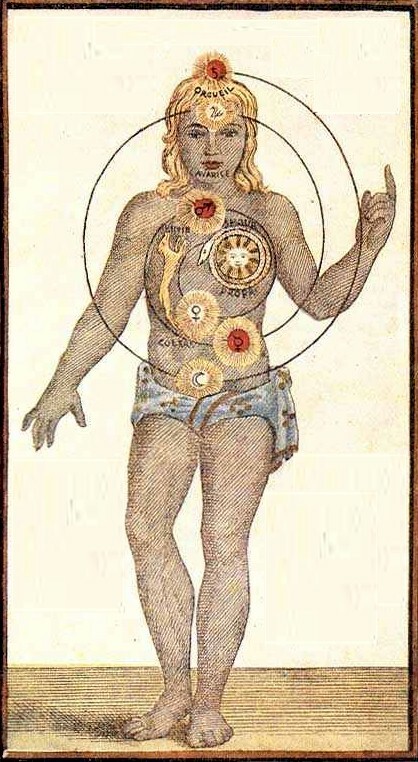 But, it is a bit more complicated than the suggestions given in the attached graphic by 17th-century mystic, Johann Gichtel. The main factor being the level of soul development of the individual. For the present, let’s just reiterate that we are all connected to the Above, the Inner Worlds, and the Universal through 3 and the 7 and the 12. Next time, we will consider how 12 fits in in a Big Way.